These beautiful patches measure 75mm in diameter (image not actual size) and can be ironed or sewn onto the surface of your choice. 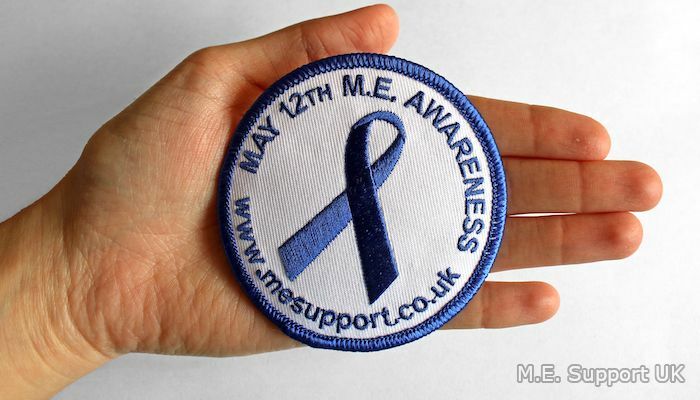 The high quality embroidered patches feature a blue ribbon surrounded by 'May 12th M.E. Awareness www.mesupport.co.uk' on a white background. I am currently unable to provide M.E. Support clothing but these patches are a perfect solution! They are ideal for jackets, t-shirts, fleeces, baseball caps, bags and much more. These exclusive patches are sold individually at £2.30 each. If you would like to place an order from outside of the UK, please Contact Me for an international delivery quote.